Shivs photography – Tamil Script in Brahadeeshwarar temple. Inspired by a line from a worried student’s recent post, I decided to write a blog post on ‘the origin of the language’, but later changed my mind… I finally decided to write about the Tamizh language instead, since this would be a rarely discussed topic. Anglicization of the word ‘Tamizh’ has resulted in ‘Tamil’, because the letter ‘’ (‘zha’ is not even the correct spelling. It simply has no equivalent in any language that I know of…) is difficult for the non-Tamizhs to pronounce. Nowadays, it seems like the Tamilians themselves are not being able to pronounce it properly – my mother is a very good example. She pronounces it as ‘ya’ instead, just like a few people do. There’s no blaming her, anyway. She was raised in a completely different city, far away from where her parents’ hometown was. She never studied Tamil, even in her school. She took up Hindi and Telugu instead. Alright… I seem to be going out of track. It seems that Tamizh has evolved through three major stages: Old Tamizh (Tamizh Brahmi), Middle Tamizh, and the modern-day Tamizh. Inscriptions of Old Tamizh in caves and pottery date back to the 3rd century BC. It was the only non-Sanskritized language back then… Pure, and full of itself, very much unlike the present-day form. It is said to have been evolved from the proto-Dravidian language that had been spoken millennia ago. This language must have been the origin of Tamizh. Tholkaapiyam seems to be the oldest work in Tamizh Literature, and its oldest parts were written in about 1st century AD. Then came the Middle Tamizh (called Sen-Tamizh in Tamizh, meaning ‘superb or best’ Tamizh… pardon my translation, it’s very rough…) at around 8th century AD. Middle Tamizh underwent major transitions and was Sanskritized, hence the similarity with other languages in modern India. The Pallavas seem to be the reason for this transformation in the language. 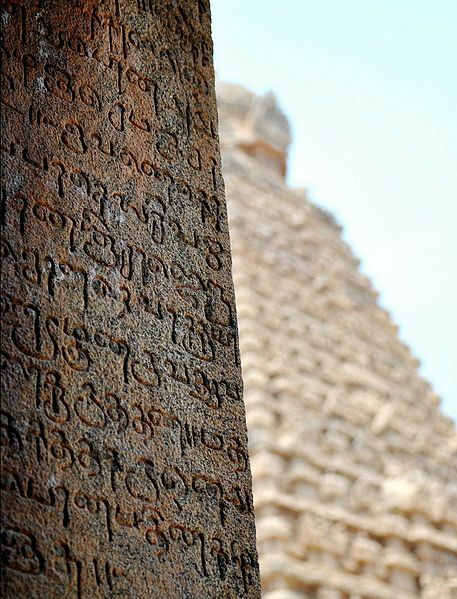 Most temples that have survived the millennium have inscriptions on them, and they must’ve been written in Middle Tamizh. I have tried to comprehend the letters and try to form words, but failed to do so. Many such inscriptions can be found in the Brahadeeshwarar temple, also called as the big temple, which had been constructed at around 1010 AD by the most revered king, Rajaraja Cholan, for constructing this fantabulous temple. It seemed odd… I could almost figure out a few successive letters in the temple, but never understood their meaning when they were put in succession. I mean, there seemed to be no continuation, and I couldn’t quite put my finger on why the few letters that looked a bit like the modern ones would carry a different pronunciation. Maybe they did not, after all. I’m not a language analyst or whatever. Anyway, experts might be able to translate it out and find sense in it, so it doesn’t matter if I can’t understand those alien-ish yet familiar script. I’d like to learn to decode translate it, though. Most temples that stand strong until now had been constructed when Middle Tamil prevailed. In Sen-Tamizh, the use of the letter ∴ had ceased, Wikipedia tells me. It’s funny, because even in modern Tamizh, when we learn the letters, this symbol is still found, but no one ever uses it… in Tamizh. That letter has recently found a use, and by putting it beside the letter ‘pa’ will make it ‘fa’. And this is needed because English has the letter ‘F’, and if an English word has to be written down in Tamizh. Because of the extended use of English in Tamizh Nadu, this letter is gaining popularity again because most of the shops put up even English words in Tamizh letters on their boards. The modern Tamizh had evolved around the 17th century, and must be very much different from the proto-Dravidian language that it had originally evolved from. It has adapted itself to the English-type punctuations, which was not allowed in Old and Sen-Tamizh. And today, people in different districts of the state speak different dialects (that too, colloquially), mingled with English. And I’d probably be the worst of all, speaking a mixed language of colloquial Tamizh, English, Telugu, Hindi, Korean and a little bit of whatever language I learn whenever and ultimately calling it… ‘Tamizh’. So… Modern Tamizh, I’d bet, is nowhere near the beautiful, independent language that it used to be. Though the language has undergone a lot of change, I doubt the script and the letter-structure had been completely modified. It seems that the Old Tamizh still has an influence on the modern-day Tamizh, because Tamizh script is different from the other languages. Hindi, Telugu and the others seem to have the same kind of letters, but Tamil has very few. It’s very unique. And I know this because I have learnt all three specified. And Malayalam must have originated from/split from Tamizh, too, because it has a similar letters. And we must be thankful to the Pandiya and Chozha (Chola) dynasties for preserving and enriching the Tamizh culture and literature, and the Chera kings for doing the same to Malayalam. But with the modern-day English craze, the ancient language of the Tamils that is sometimes even compared with Sanskrit will soon evolve into something else, and might also bring a few English and other words into its vocabulary.